Algonquin Park is massive. At over 7,700 square kilometers, it is larger than Banff National Park or the entire province of Prince Edward island. Replenish your body and soul in Algonquin Park’s backcountry. Exploring Algonquin Park in a canoe is an experience you will never forget. Visitors who travel the waterways of Algonquin are privy to a special world – a world far from telephones, televisions and deadlines. A world of quiet events and new adventures. You’ll be rewarded by the sight of animals in their natural habitat. You’ll have the chance to swim in a secluded bay, fish in a quiet pool and camp in a remote setting. You can challenge yourself with a full day’s paddle and a long portage or idle away an afternoon paddling close to shore. Either way, it’s a relaxing experience that takes you back to basics in some of the world’s most beautiful scenery. Come; replenish your body – and your soul – in Algonquin Park. Don’t be intimidated. Canoeing in Algonquin Park consists of mainly flat water canoeing and portaging. There is very little white water, which means you do not have to be an experienced canoeist to voyage in. The major lakes are joined by small creeks, rivers and well-marked portage trails. The portage trails range in length from less than 100 meters to over 1 or 2 kilometers. The longest in the Park is 6,400 meters –which means you can plan a quest from 2 to 10 days or more. We can help make it simple with some advice, planning and a detailed Algonquin Park Canoe Route Map. First word of advice: travel light! You are portaging your gear between water ways. The key to a successful canoe trip in the Park is having the right equipment and supplies. Weight is a critical factor. Our lightweight Kevlar canoes and compact camping gear are ideal. The Portage Store has over 30 years of experience outfitting Algonquin canoe trips and can ensure your canoe trip is safe and enjoyable. 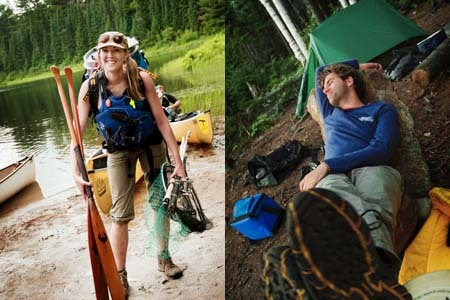 From essential supplies, Outfitting Packages to Guided Trips; let The Portage Store help you thrive in the wilderness of Algonquin.